Huckleberries are berry-producing shrubs that are closely related to blueberries. There are several species found in the wild in various parts of North America which are sometimes used as landscaping plants. Individual species vary, but huckleberries are generally densely branched upright shrubs growing anywhere from one to 10 feet tall. They have small, oval-shaped leaves with pointed tips, tiny urn-shaped flowers, and pea-sized edible berries. The flavor of huckleberry fruit is reminiscent of a strongly flavored blueberry. They are not grown as a commercial crop, but are sometimes harvested on a large scale from the wild and can be found in grocery stores and roadside stands. The fruit ripens in mid-summer though it will take several years after planting to begin to bear. In the wild, huckleberries are often found growing in forest environments though they are tolerant of almost any amount of sun or shade. Berry production is reduced in the shade, but water requirements are minimal and the shrubs typically grow taller; in full sun there is risk of leaf scorch if the plants are not irrigated heavily, but they produce copious amounts of fruit and tend to be shorter and more compact. Huckleberries need well-drained soil that is rich in organic matter. They are adapted to acidic soil conditions, which can be created artificially if necessary by adding peat moss, sulfur, or aluminum sulfate to the soil. Huckleberries are generally planted from nursery grown container plants, rather than from seed. Plant gallon-size or larger plants in fall or early spring when the weather is cool for best results. Gently loosen the roots on the outside of the root ball before planting and dig a hole that is twice the width of the root ball but an equivalent depth. Make sure the top of the root ball is even with the surrounding soil level to ensure that the root crown has adequate drainage. Because of their berries and dense vegetation, huckleberries are valuable as wildlife habitat and are a good choice for naturalized woodland plantings. They can also be used as informal hedges along property lines or to divide various parts of the landscape. 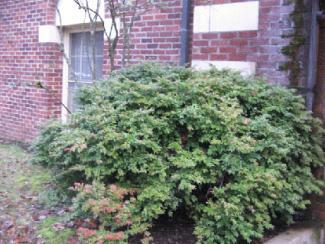 Most have a fairly compact, orderly growth habit, but are not the sort of shrub you would shear into a formal hedge. 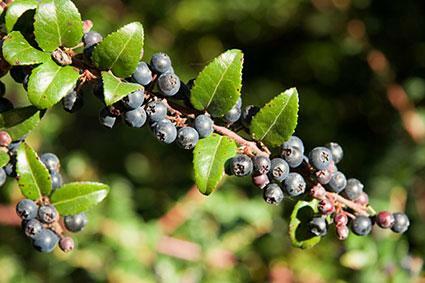 Huckleberries have similar growing requirements to blueberries, azaleas, rhododendrons, gardenias, hydrangeas, and many fern species, all of which make great companions in a planting scheme. Huckleberries can be divided between those that are native to eastern North America, which are in the genus Gaylussacia, and those that grow in the west, which are in the genus Vaccinium. Huckleberries are not commonly available at retail nurseries other than those that specialize in native plants though they can be found online at mail order nurseries. Black huckleberry (G. baccata) grows two to three feet tall and has reddish flowers followed by black fruit. It has larger leaves than most other huckleberries, growing up to three inches long. It's deciduous and does well in USDA zones 3 to 8. Box huckleberry (G. brachycera) grows one to two feet tall and has pink flowers followed by blue fruit. It has more of a spreading habit than most other other huckleberries and can grow into extensive colonies. It is deciduous and is hardy in USDA zones 3 to 7. Evergreen huckleberry (V. ovatum) grows from four to eight feet tall and has whitish-pink flowers followed by purplish-black fruit. 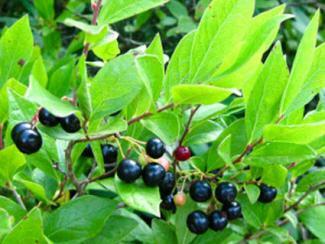 It has thick, glossy leaves and is the only huckleberry species that is evergreen. It is hardy in USDA zones 7 to 9. 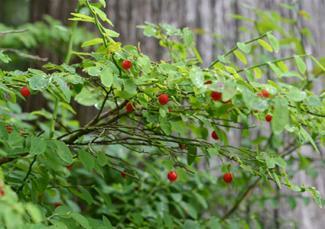 Red huckleberry (V. parviflorum) grows from six to 10 feet tall and has light pink flowers followed by red berries. The leaves are thin and light in texture compared to other huckleberries. USDA zones 6 to 8 provide optimal growing conditions. Huckleberries are extremely low maintenance plants. There is little reason to prune or fertilize them, although they should be kept well-irrigated. Maintaining a deep layer of mulch over the root zone is one of the best things that can be done to to keep them healthy. Pests and disease are rarely a problem with huckleberries. Huckleberries are lovely native shrubs worthy of more attention as landscape plants. Though they lack any single stunning feature, they are very attractive overall and produce delicious fruit as a bonus.